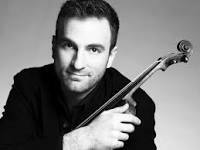 Fundraiser concert of renowned violinist Stefan Milenkovic was held on June 6, 2014 in Chicago. In addition to the famous violinist, the concert was also attended by pianist Rohan De Silva. Music artists performed in front of a full Fulton Hall of the University of Chicago. After the concert the audience had the opportunity to meet the artists. Collected donations at the concert will be utilized to aid the recovery of the flood affected regions in Serbia. The concert was organized by the Serbian American Museum St. Sava - Tesla.